(Delphin’ium). Hardy perennial and annual plants of varying heights which bloom in June and July chiefly; the original species or wild types from which the modern beautiful varieties are descended are natives of California, Siberia, Syria, India and other countries. Delphinium Ajacis, originally from eastern Europe is one of the plants from which the annual Larkspurs have been raised. Delphinium belongs to the Buttercup family, Ranunculaceae. The name is an old Greek one. Numerous beautiful named varieties of theperennial Delphinium have been raised in Europe and are there propagated vegetatively, but in North America Delphiniums are not commonly long-lived and it is customary to propagate by seeds and to raise fresh stocks frequently. Good strains of seed give a high percentage of magnificent flowers. Delphiniums thrive best where summers are cool. Beautiful Colors. The varieties with pale blue or bright blue flowers are the chief favorites, but the color range has been extended and includes mauve, rose mauve, pink, lavender, purple and indigo. Some of the flowers are of two colors, for instance, blue and white, purple and mauve, blue and mauve, purple and blue. The newest type is characterized by immense spikes of large blooms and unusually vigorous growth. Although the chief flowering season of the perennial varieties is in June and early July, if the main spike is cut off when the flowers have faded, smaller, secondary shoots will prolong the display. It is often advised that after the first flowering the plants should be cut down to the ground for the purpose of encouraging the development of a second crop of bloom in late summer. This, however, is not to be recommended; it is bound to weaken the plants, for it deprives them of their large leaves. A better plan is to cut the flower stalks above the uppermost good leaves and then fertilize and keep well watered to encourage strong new growths. Preparing the Ground and Planting. 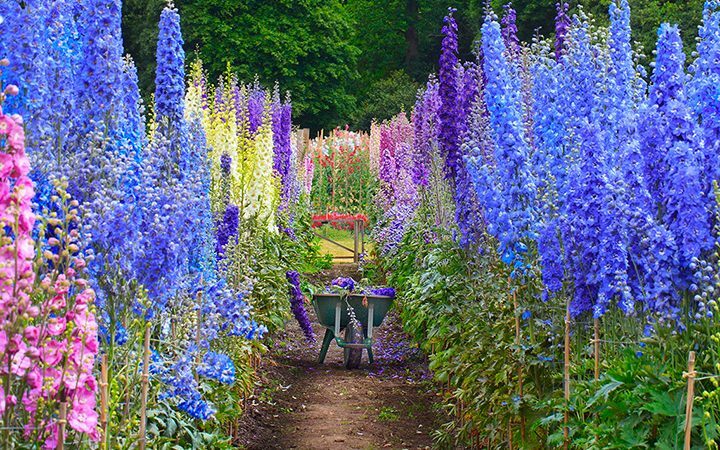 The perennial Delphiniums vary in height from 4-8 ft.; they should be planted in deeply dug and manured ground in a sunny position. In poor, dry or shallow ground they are but ghosts of themselves. The way to ensure the finest possible plants is to provide them with deep, fertile soil. Decayed manure or compost should be mixed with the lower soil, and compost and bone meal with the upper layer. Planting may be done in early fall or early spring. The plants should be set from 2-3 ft. apart, according to the ultimate height of the variety. Preventing Damage by Slugs. When Delphiniums start into fresh growth in spring the young shoots are liable to be destroyed by slugs, particularly in wet or damp weather. Old sifted ashes placed round and among the shoots serve to protect them from serious damage, but a certain way of keeping them safe is to scatter a mixture of equal parts copper sulphate and hydrated lime on the soil round about, but not touching, the plants. A slug bait scattered around the plants is also effective in destroying the slugs. Staking the Plants. When warm, moist weather sets in, Delphiniums grow very quickly, and it is necessary to support the soft stems in good time to prevent their becoming bent, for if that happens the flower display will be spoilt. A few of the tallest and strongest stems should be supported separately by bamboo canes; for the rest it is enough to place three or four canes around the outside of the clump and connect them by several rows of twine, the rows about 12 in. apart. The canes should be of such a height that they will not be conspicuous when the plants are in bloom. Thinning Out the Shoots. An established plant of perennial Delphiniums will produce numerous shoots, some much more vigorous than the others; it is a good plan to remove the weakest ones, for they will not bear good spikes of bloom and to some extent they hinder the development of other and better ones. If the finest possible flower spikes are wanted the plants should be fed with dilute liquid fertilizer once a week from the time the buds show. When the flowers have faded the stems should be cut down to the level of the leaves to prevent the development of seeds. If it is wished to save seeds of a particularly attractive variety, the faded blooms should be left on the best spike. The varieties, however, do not come true from seeds. As the leaves fade the stems may be shortened gradually until finally, in early autumn, they are cut down to the ground. Every year, in spring, it is an advantage to apply decayed manure to soil around Delphinium plants and to fork it lightly into the ground. An annual application of bone meal at that time is also beneficial. There are two chief types of the perennial Delphinium, those which bear long, closely set spikes of bloom, and those of the Belladonna type which are of slender, branching habit of growth and very graceful. With Red and Pale Yellow Flowers. Of the species or original wild types of Delphinium these are chiefly worth cultivation in gardens: D. Brunonianum, 18 in., blue; D. cardinale, 18 in., scarlet; D. grandiflorum, 18 in., blue and its variety, Blue Butterfly; D. nudicaule, 15 in., orange-scarlet, suitable for the rock garden, or light, well-drained border soil; and D. sulphureum (Zalil), 2 1/2 ft., pale yellow. When to Sow Seeds. It is a simple matter to raise a stock of perennial Delphiniums from seeds sown in a flat of sifted sandy soil placed in a cold frame in April, or in the outdoor garden in May. The plants will bloom the following year; some of them may produce small spikes of bloom in the autumn of the first year. If the seeds are sown thinly the seedlings may remain undisturbed until planted in nursery rows; this should be done in May or June. They should then be set 6 or 8 in. apart, in rows a foot apart, and left undisturbed until the following spring when they should be planted where they are to remain. 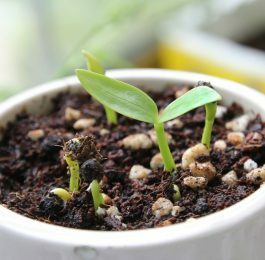 Seeds sown in a 50-degree temperature in a sunny greenhouse in January will produce plants that if transplanted to flats or pots and kept growing will be ready for hardening off and transplanting outdoors in late April or early May; they will bloom well the first year, slightly later than older plants. Annual Larkspurs. There are two types of annual Larkspur—plants which bloom in July–August if raised from seeds sown out of doors in March–April, or in June if the seeds are sown out of doors early in September. Autumn sowing out of doors is not recommended on heavy clayey soil, for there are certain to be serious losses among the seedlings during winter. Autumn-sown plants, however, especially of the tall, branching Larkspurs, are finer than others raised in spring, and sowing in September is to be favored on well-drained or light soil. Another way is to sow the seeds in flats of sandy soil early in September, keep the flats of seedlings in a frame during the winter, and plant them out of doors in April. Exquisite Pink, La France, soft salmon-pink; Los Angeles, rose-salmon; Miss California, deep salmon, and Rosamond, deep rose pink. The dwarf annual Larkspurs, descendants of Delphinium Ajacis, grow about 12 in. high, and are useful for grouping towards the front of the herbaceous border where they furnish bright patches of color when they bloom during the early summer. Greenhouse Culture. Both perennial and annual Delphiniums (Larkspurs) may be grown in greenhouses to provide attractive pot plants and useful cut flowers. To ensure success the greenhouse must be fully exposed to the sun. A night temperature of 45-50 degrees and daytime temperatures 5-10 degrees, or on very sunny days 15 degrees, above the night temperatures are satisfactory. Seeds of annual Larkspurs may be sown from August to January in sandy soil in well-drained pots. The young seedlings are carefully transplanted individually to 2 1/2-in. pots and later repotted in 4-5-in. pots or are planted in soil‑filled benches. When the latter plan is followed they are spaced 6-8 in. apart. It is important that the soil for Larkspurs be porous, well drained and reasonably fertile. After the soil is filled with roots weekly applications of dilute liquid fertilizer are beneficial. Excessive dryness of the soil is to be avoided, but overwatering to the extent that the soil remains saturated for long periods will bring disaster quickly. Neat staking and tying are necessary to support the plants. To obtain the best results in forcing perennial Delphiniums, young plants should be planted in a deeply spaded, well-fertilized bed in a sunny location outdoors in early spring. The plants may have been raised from seeds sown in a greenhouse in January, or in a cold frame the previous summer. They should be spaced 12-18 in. apart in rows 2-3 ft. apart. Throughout the summer every possible care in such matters as weeding, cultivating, watering, etc., should be given attention. If flower spikes form, they should be cut off before they open more than one or two flowers, but care should be taken not to remove more leaves than absolutely necessary. After the first hard frost of fall the plants should be dug up, care being taken to preserve as many roots as possible, and potted in rich soil in well-drained pots large enough to hold the root balls without crowding. This normally requires pots 6-8 in. in diameter. When potting is completed the pots are well watered and are plunged (buried to their rims) in cinders, sand or peat moss in a cold frame and left until early the following year. 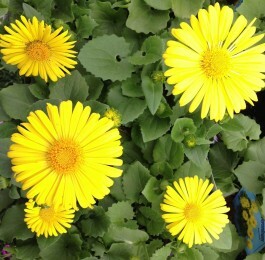 In January or February, the potted plants may be brought into the greenhouse. They should be watered carefully at first, more freely as growth develops. The young shoots that develop should be thinned out, the weakest being removed and 1-5 of the strongest left to grow and bloom. After growth is well started and the pots are filled with healthy roots, weekly or semiweekly applications of dilute liquid fertilizer will stimulate further growth and favor good-quality flower spikes. Neat staking and tying to keep the stems erect and straight are necessary.